Moisture Reducing Barrier is recommended for concrete slabs with a calcium chloride reading of 8 pounds or more per calcium chloride test. 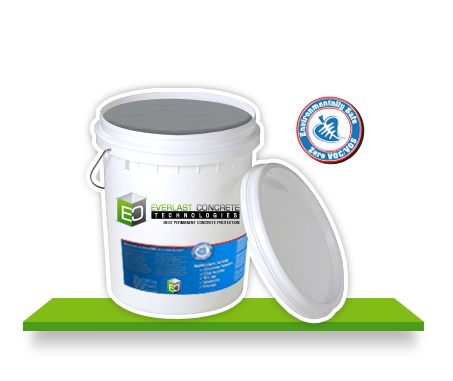 Moisture Reducing Barrier, (concrete moisture reducer) is a colloidal silicate base subsurface barrier. Rather than covering up the challenge of excessive moisture in concrete, Moisture Reducing Barrier reduces the moisture vapor emission from the concrete matrix to acceptable levels for all types of flooring installations. When Moisture Reducing Barrier is applied to concrete, it penetrates deeply below the surface porosity to the matrix and capillary system reacting with concrete’s unbound (free) constituents, such as alkali and / or inactivated calcium hydroxide residue. This unique reaction converts the Moisture Reducing Barrier liquid, (which is virtually zero in solids) into a 100% solids colloidal silicate precipitate (gel) that is internally generated and very insoluble. This Moisture Reducing Barrier gel forms and occupies the concrete’s “surface” accessible porosity and internal tiny voids.